The dramatic hearing on the eve of Thursday’s poll had stoked opposition hopes of delaying the vote boycotted by their leader Raila Odinga. 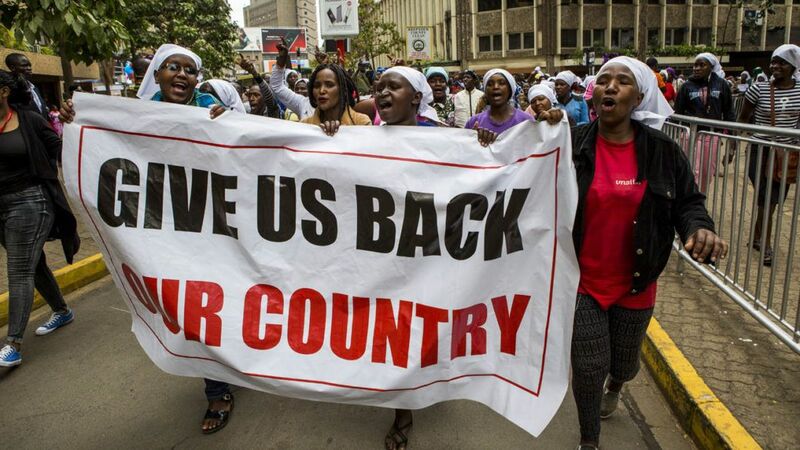 With political tensions soaring ahead of the vote, even the country’s top election official has said he cannot guarantee a free, fair and credible election, prompting concerns at home and abroad about the risks of holding another flawed election. Chief Justice David Maraga, who overturned the August 8 victory of President Uhuru Kenyatta, was forced to ditch the planned hearing, as only two of seven judges were present in court. At least five judges are needed to form a quorum. Maraga said his deputy, Philomena Mwilu, could not attend after her bodyguard was shot on Tuesday evening. She was not in her car at the time but the incident fuelled anxiety in a country still reeling from the torture and murder of an IT official at the election commission before August’s vote. Another judge was ill and out of the country, one could not get a flight to Nairobi and two were “not able to come to court,” he said. The hearing was one of dozens of legal battles that have gripped the court system since Maraga’s September 1 decision to cancel the result of the first election due to “irregularities” in the electronic transmission of results, and mismanagement by the Independent Electoral and Boundaries Commission (IEBC). Also Wednesday, the High Court said the appointment of 290 constituency returning officers, who scrutinise the ballot, had not been done in accordance with the constitution. But the judge said quashing their appointment would create a “crisis of unimaginable magnitude”, so the decision is unlikely to impact Thursday’s election. It will, however, open the way for further legal battles over the outcome. The election was meant to pit Odinga, 72, and Kenyatta, 56, against each other for the third time, in a dynastic political rivalry that began with their fathers following independence from Britain. But while Odinga secured a rare victory in having the August ballot overturned, he has refused to take part in the rerun. Although he initially called for mass protests on election day, on Tuesday in an interview with the BBC he denied doing that, urging supporters to “stay away”. However on Twitter, his National Super Alliance (NASA) coalition insisted the protests were still on. Odinga has vowed to announce his final decision on the election at a rally in Nairobi on Wednesday afternoon, where several hundred supporters have already begun gathering. Nairobi city officials have already branded the gathering “illegal”, saying the opposition had not followed proper procedures to hold the meeting at Uhuru Park. Meanwhile, in Odinga’s western stronghold of Kisumu, hundreds of opposition supporters marched towards the IEBC’s offices. Top diplomats and observers have excoriated both Odinga and Kenyatta for sowing division with inflammatory rhetoric, and refusing to hold joint meetings with the IEBC that could open the way to a free and fair election. The IEBC itself has also been riven by internal discord. Last week, a top commissioner quit her job and fled the country, citing fears for her life and intimidation of poll officials, and just hours later IEBC boss Wafula Chebukati declared he could not guarantee a credible election. He said the commission was logistically ready to carry out the election, but lambasted political interference in the vote and raised doubts that the environment was conducive for voters to exercise their rights. Weeks of uncertainty have hit east Africa’s richest economy hard. “It’s very disturbing, everything is at a standstill. We have to wait for this election to pass to go back to our daily normal routines,” said voter Edward Irungu, 31. The crisis is the worst since a disputed 2007 election sparked months of politically-motivated ethnic violence that left 1,100 dead. The 2017 crisis is different in many ways, although opposition protests have resulted in 40 people being killed, mostly at the hands of police and in poor opposition strongholds, according to rights groups. Citing extreme tensions, an uncertain political environment and lack of a fully competitive election, missions from the European Union and Carter Centre have decided to limit their observation of the vote.